Americans' respect, reverence, love and outright worship of Michael Jordan might never end. 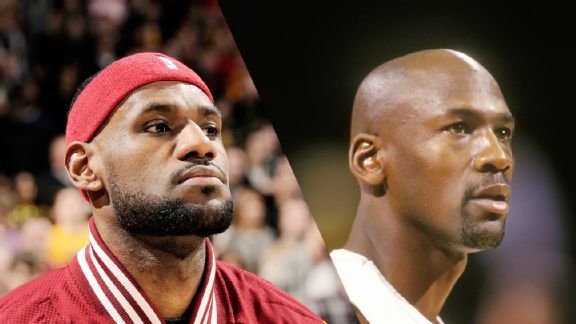 The latest evidence: In a recent survey of 1,471 registered voters conducted from May 7 to May 10, Public Policy Polling found that not only do 77 percent of people find Jordan to be the greatest NBA player of all time, but 34 percent said MJ would beat LeBron James one-on-one ... right now. Only 54 percent said LeBron would win the matchup. Reminder: Jordan is 52, and retired from basketball 12 years ago after posting decent but very un-MJ-like stats (19.3 player efficiency rating and a pedestrian 6.2 win shares). James is 30, just finished third in NBA MVP voting, posted a 25.9 PER and 10.4 win shares, and scored 38 points and grabbed 12 rebounds in a playoff game. Now, these being registered voters and therefore 18 and older, it's possible that their age and memories of vintage Jordan are influencing their opinion. It's also possible that you agree with their assertion -- that MJ was just so good as to be unbeatable. We don't agree; while we're on board with Jordan being the clear No. 1 all-time, today this matchup wouldn't even be close. Now it's time for you to decide, then check out who is America's favorite NBA player (you can also read the full report here).